Beautifully designed, versatile and durable, the Hydrolux Combi Macerator Pump makes it easy to install a bathroom, toilet, utility room or even a kitchen anywhere in the home. 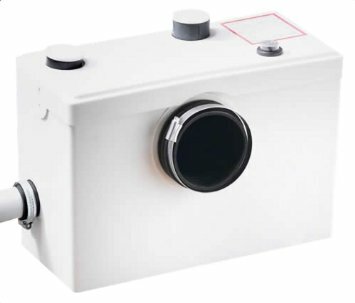 Giving households the tools that they need to make their property work for them, this innovative piece of kit is the perfect solution to your plumbing needs. 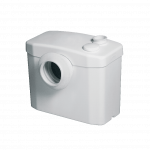 Thanks to its elegant design and unobtrusive contours, the Hydrolux Macerator Pump is relatively inconspicuous, allowing it to fit seamlessly into your new bathroom, toilet or utility room. The unit’s simple, effective design makes it ideal for use in spaces where additional masonry work would be prohibitively expensive or impractical. Able to pump waste up to 5.5m vertically and 60m horizontally, the Hydrolux Macerator Pump offers homeowners a huge amount of flexibility when deciding on a layout for their new extension, renovation or annex. The unit is impressively quiet, with the motor running for just 10 to 20 seconds when activated. 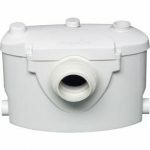 Ideal for domestic use, this versatile unit can be connected to a toilet, washbasin and shower simultaneously. 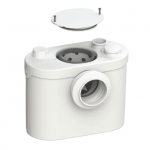 Alternatively, when used in a kitchen or utility room, the Hydrolux Macerator Pump can be used to discharge the waste from either a kitchen sink, dishwasher or washing machine. Though the Hydrolux Macerator Pump is quick and easy to fit, it will need to be installed by a qualified professional, in line with the manufacturer’s instructions, for optimum performance. Compact, hardwearing and stylish, the Hydrolux Macerator Pump is a well designed, high performance unit that can be used for a variety of functions throughout the home. 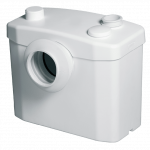 Thanks to our extensive experience in the world of plumbing, we can help you to find the perfect pieces to go with your new Hydrolux Macerator Pump and create the home you’ve always wanted. What’s more, thanks to our quick delivery times and low prices, you’ll have your new unit before you know it. If you’re thinking about adding a valuable extra bathroom, useful utility room or luxurious en suite to your property, we’re guaranteed to have the perfect solution to your plumbing needs. To find out more or to view our full product range, take a look around our site today.